Having guests over. It’s been such a staple of the theatre, from The Glass Menagerie to Who’s Afraid of Virginia Woolf, that it can feel like an impossibly hackneyed trope. 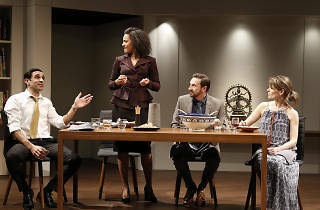 But it’s easy to see the scenario’s appeal to the playwright: it forces a confrontation of competing viewpoints in a single setting, often under the influence of alcohol. It’s inherently the stuff of drama. 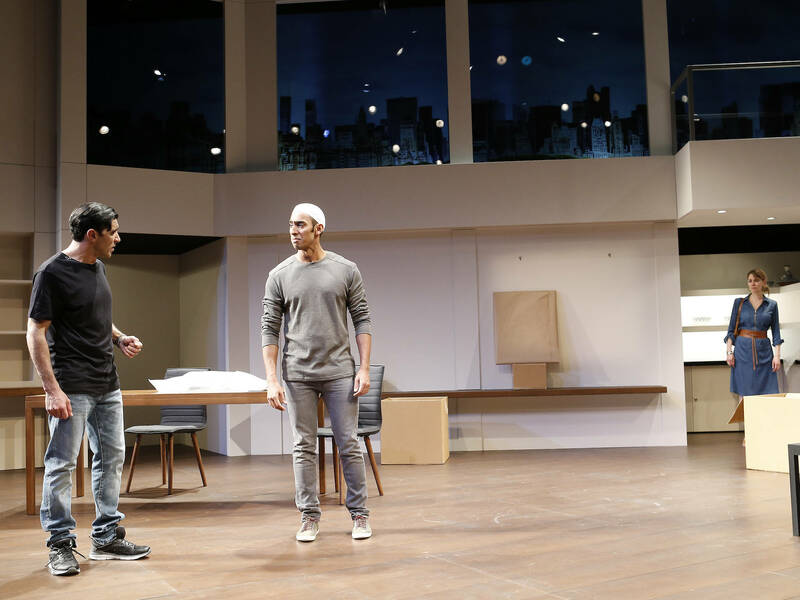 MTC’s Disgraced sees US playwright Ayad Akhtar dip into this broiling pool, through the lens of Islamophobia in a post 9/11 world, with electrifying results. No one leaves the theatre without burns to the wrists and ankles. Amir (Hazem Shammas), a successful lawyer who nonetheless senses the limits of his acceptance in the highly codified world of New York’s legal fraternity, is married to Emily (Kat Stewart), an artist just beginning to come into her talent. Despite his Muslim upbringing, he is vehemently anti-Islam, in a position that starts to look self-effacing, while she embraces Islam, as far as it informs her art. Their truce is decidedly shaky from the start. These ideological positions are tested, and proved wanting, when their friends Isaac (Mitchell Butel) and his wife Jory (Zindzi Okenyo) come over for dinner. Isaac has something Emily desperately wants, and Jory has already taken something Amir desperately needs. Not surprisingly, the dinner is disastrous. It’s the fallout, however, that really muddies the waters. Nadia Tass was an inspired choice to direct, and her verisimilitude and psychological insight inform every moment. The performances are simply brilliant. Butel is utterly convincing as an alternately smarmy and morally compromised New York art curator, and Okenyo is wonderfully sharp as his perspicacious wife. As the central couple, Stewart and Shammas are a casting director’s dream. She brings such a wealth of compassion to the role of Emily, such a heartbreaking mix of naivety and fragility, that it becomes almost unbearable to watch. Audiences may be forgiven for questioning her decision to concentrate her career on television, when she proves herself so effective on stage. Shammas is nothing less than revelatory as the tortured, tragic figure of Amir. Only a playwright with an intimate understanding of what it’s like to live as a Muslim man in America after 9/11 could write a character like this, and only an actor at the height of his powers could play it so convincingly. He is mesmerising; at turns frightening and pathetic, feverish and jocular, it feels like he’s living his life walking on eggshells, until everything breaks. The production is smartly staged and cleverly designed (set by Shaun Gurton, costume by Jill Johanson and lighting by Nigel Levings) and the whole thing moves at a cracking pace, enlivened by some very funny and excruciating banter. 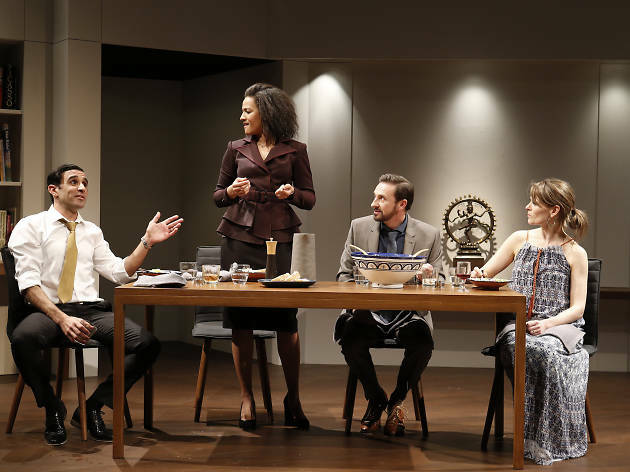 Disgraced won the 2013 Pulitzer prize for drama, and it isn’t hard to see why. It delves with absolute courage into the most fractious and deadly issues of our times, and it does so without resorting to didacticism or simplification. Conflicting perspectives are thrown up and allowed to settle on the audience, unresolved and troubling. The result is theatre so powerful it leaves marks on the brain.